The ideal activity for groups of all sizes, ages and abilities, archery is truly the sport for everyone. Whether it’s a team building event for a small group, a break-out activity at your next conference, product launch or networking event or a have-a-go suitable for families with small children at your company BBQ. We have the skill and experience to deliver a unique and personal service that is guaranteed to leave a smile on the faces of your staff and clients. We offer a fully customisable experience and with our specialised equipment can deliver a safe and exciting event in the smallest of locations, even indoors! Let our highly qualified coaches bring a taste of this Olympic sport to your next event. With 35yrs+ combined experience as Scout and Guide leaders, we are ideally qualified to deliver archery to your Brownie/Guide unit or Scout Group. With specialist equipment we can also bring the archery experience to Rainbow units and Beaver Colonies! Looking for something different? Then why not add the Master-at-Arms badge to your next Scout programme and invite us along to deliver it. All the programme materials including the final competition format brought direct to your meeting place. Put your feet up while we do the evening for you! The Bride & Groom will have something extra to remember their special day with when they hit the gold together once they've tied the knot. 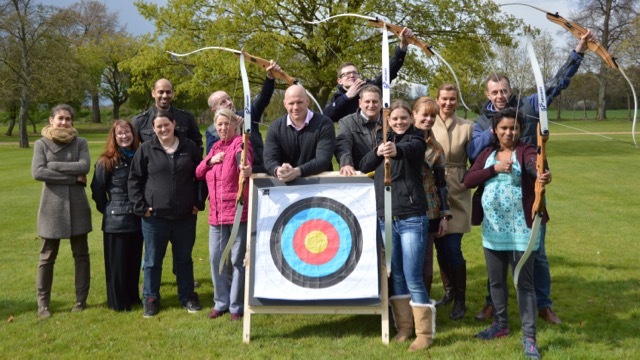 Guests too will be sure to have extra special memories of the day when you incorporate archery in your reception plans.